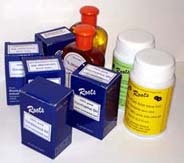 Along with the herbal treatments (see product list on the left side of the screen) we now offer Aromatherapy kits for some of the most common skin and hair disorders. Herbal treatments and Aromatherapy treatments work differently. One uses the extraordinary healing power of herbs combined with essential oils, while the other uses the extraordinary power of fragrance and energy stored in each drop of pure essential oils. Aromatherapy means treatment with the help of fragrance. Potent yet subtle, reviving yet restoring, these health and beauty treatments are safe and work on both body and mind. A single drop of essential oil can store and release the energy of an entire plant. All our essential oils are 100% pure and do not contain chemicals, or base oils. These essential oils must be mixed with the recommended base oil in each kit listed below. Important: Please note that all our essential oils and base oils are 100% Pure, highest quality Aromatherapy Grade Oils. Aromatherapy requires Aromatherapy Grade oils. Substituting these oils with other cheap, mixed oils will not give desired results. Mix the above and massage on stretch marks thrice a week. Kit includes one 10 ml bottle each of the above mentioned main essential oils (100% pure, highest quality Aromatherapy Grade), plus one 50 ml bottle of Sesame oil (100% Pure, Aromatherapy grade) base/carrier oil. The main essential oils will last a long time. Additional base/carrier oil could be bought separately as and when needed. Mix the above and massage 3 times a week. Aloe Vera Gel : 30 ml. Mix the above and apply all over the face. Leave it on for at least one hour and rinse it off. You could also leave it on overnight and rinse in the morning. Kit includes one 10 ml bottle each of the above mentioned main essential oils (100% pure, highest quality Aromatherapy Grade), plus one 100 ml bottle of 100% Pure Aloe Vera Gel. The main essential oils will last a long time. Additional Gel could be bought separately as and when needed. Mix the above and massage hands, fingers and nails. Mix the above into a paste and apply on face as a pack. When the paste dries out and you start feeling the skin stretching, wet the pack and rinse the paste off. Kit includes one 10 ml bottle each of the above mentioned main essential oils (100% pure, highest quality Aromatherapy Grade), one 40 gm bottle of Multani Mitti (100% pure and sterlized), plus one 100 ml bottle of 100% pure Aloe Vera Gel. The main essential oils will last a long time. Additional Gel could be bought separately as and when needed. Mix the above and apply to hair, scalp and massage. Leave it on for 1-2 hours and rinse it off during shower. Kit includes one 10 ml bottle each of the above mentioned main essential oils (100% pure, highest quality Aromatherapy Grade), plus one 100 ml bottle each of 100% pure Aloe Vera Gel and 100% Pure Hibiscus Gel. The main essential oils will last a long time. Additional Gels could be bought separately as and when needed. Mix the above and apply to the roots and hair. For long hair, wrap the hair together in a cloth or any hair wrap. Leave it on for 2 hours and wash it off. Use twice a week. Mix the above and apply to hair roots, scalp and hair. Massage and leave it on for an hour and rinse it off. Kit includes one 10 ml bottle each of the above mentioned main essential oils (100% pure, highest quality Aromatherapy Grade), plus one 100 ml bottle of 100% pure Hibiscus Gel. The main essential oils will last a long time. Additional Gel could be bought separately as and when needed. Mix the above and apply to hair roots, scalp and hair. Massage and leave it on for an hour and rinse it off. Use 2-3 times a week. Mix the above and apply to hair, hair ends, hair roots and scalp. Massage and leave it on for an hour and rinse it off. Use 2-3 times a week. Mix with 100 ml water and gargle twice a day. Soak fingers and nails in the above mixture for 3-5 minutes and massage. Massage above mixture externally on ears, nose, forehead and around ears. Massage the above mixture until the oil is completely absorbed. Mix the above. Take 3-4 drops of this mixture and rub on arms, neck and hands. The fragrance remains all day. Kit includes one 10 ml bottle each of the above mentioned main essential oils (100% pure, highest quality Aromatherapy Grade). Add to 500 ml of warm water in a bowl and keep it in the middle of the room.